The journey of Clare Florist has been a long, rich and rewarding one. From our humble beginnings as a small fruit and flowershop in 1978 right up to our present day status as one of the UK's most acclaimed and respected online florist, we've always placed customer satisfaction directly at the forefront of our approach to selling flowers. The 8th of July 1996 is a very special day for us as this is when we had our very first ever online order! For over 20 years now we have been accumulating experience and perfecting the customer experience as one of the UK's longest established and most trusted online florists. Whether you are looking for a personal way to express your affection for loved ones away from you, or make that first impression which will make that special someone smile in years to come, Clare Florist can provide just the right bouquet to get your message across. Being a family owned business, we believe that sending flowers should be a pleasure. That is why we use only the very best graded flowers under strict quality controls, along with the most reliable next-day delivery service to create the most pleasant and smooth experience for you. 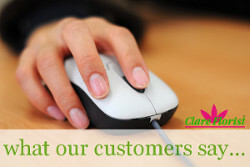 At Clare Florist, each order counts for us. Whether the order is large or small, customer satisfaction is our top priority, meaning that we are always dedicated to ensuring that our flowers arrive on time and in exceptional form every time. Like our customers, we believe that top quality products and service should only be expected as norm. What ultimately makes us unique, however, is the experience and expertise which our talented floral design team have accumulated from our past 32 years in the business. These attribute to the colourful inspirations which perfect our every bouquet, taking floral presentation into a whole new dimension which gives us the edge over our competitors. The artistic arrangements of colours and variety of flowers used at Clare Florist means that for every occasion there is a captivating selection to choose from. That is why our customers keep coming back. And if you are still not convinced, do take a look at what our customers have said about their experience with us in the past. So now, pick the bouquet that feels the most irresistible to you and leave the rest to us - you can sit back and feel good about making someone's (or your own) day today!